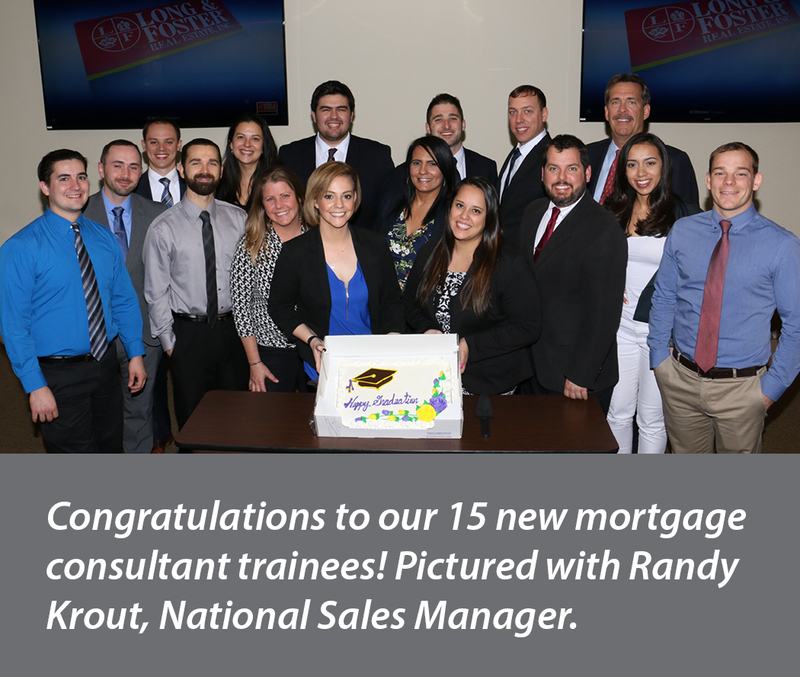 Prosperity Home Mortgage, LLC (Prosperity) would like to congratulate 15 new Mortgage Consultant Trainees for having graduated the Prosperity Mortgage Consultant Training program on Wednesday, April 6, 2016. The training program continues as the new trainees will spend the next 60 days partnering with Prosperity’s most successful mortgage consultants to give them valuable real life experience in addition to their classroom training. Learn more about careers at Prosperity Home Mortgage by visiting our Careers Webpage, or follow @PHMJobs on Twitter to get daily updates on the latest job openings. 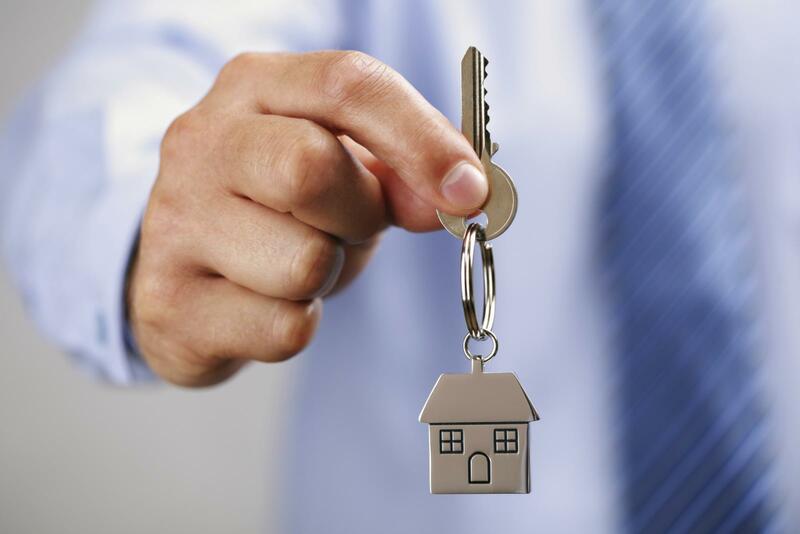 All first mortgage products are provided by Prosperity Home Mortgage, LLC. (877) 275-1762. Prosperity Home Mortgage, LLC products may not be available in all areas. Licensed by the NJ Department of Banking and Insurance. Licensed by the Delaware State Bank Commissioner. Also licensed in District of Columbia, Georgia, Maryland, North Carolina, Pennsylvania, South Carolina, Tennessee, Virginia, and West Virginia. We are proud and excited to share that Prosperity Home Mortgage, LLC, (Prosperity) been recognized for its exceptional mortgage originators by Mortgage Executive Magazine! The industry publication honored both The Nation’s Top 200 Mortgage Originators, as well as The Nation’s Top 1% of Mortgage Originators, in its winter 2016 edition, and 26 members of the Prosperity team were named to these exclusive lists. 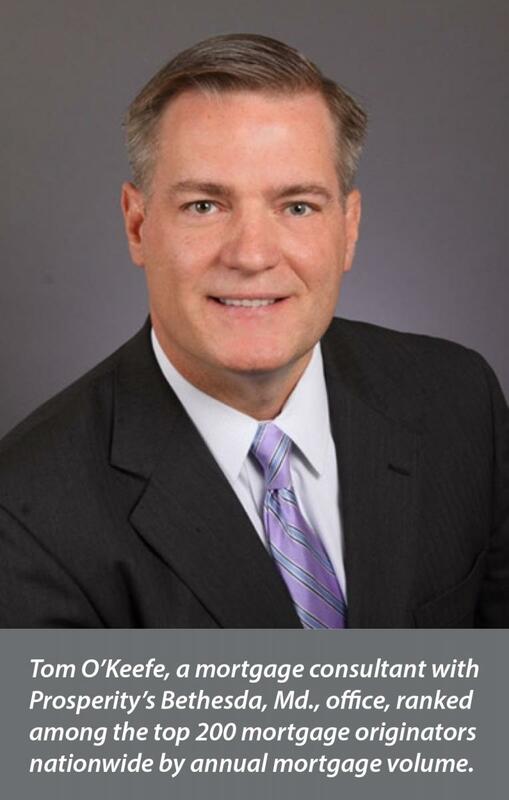 Tom O’Keefe, a mortgage consultant with Prosperity’s Bethesda, Md., office, ranked among the top 200 mortgage originators nationwide by annual mortgage volume. In total, there are over 380,000 state-licensed mortgage loan originators in the United States*, and O’Keefe was named as No. 119 for the country. He has been in the mortgage industry for over a decade, and he closed 208 loans for a total volume of $100,407,831 in 2015. Glenn Benson, North Bethesda/Rockville, Md. Jacob Darwish, Gaithersburg/North Potomac, Md. Michael Graff, Devon and Haverford, Pa.
Mona Guynn, Vienna and Oakton, Va.
Christopher Siegel, Reston and Herndon, Va.
Michael Storti, West Chester, Pa.
Rex Ann Strecker, Mt. Pleasant, S.C.
William Woodfin III, Midlothian, Va. The two lists appear in the winter 2016 issue of Mortgage Executive Magazine, which can be viewed online at http://mortgageexecutivemagazine.com/MEM16-01Winter2016/#?page=0. Congratulations to the best team in the industry! 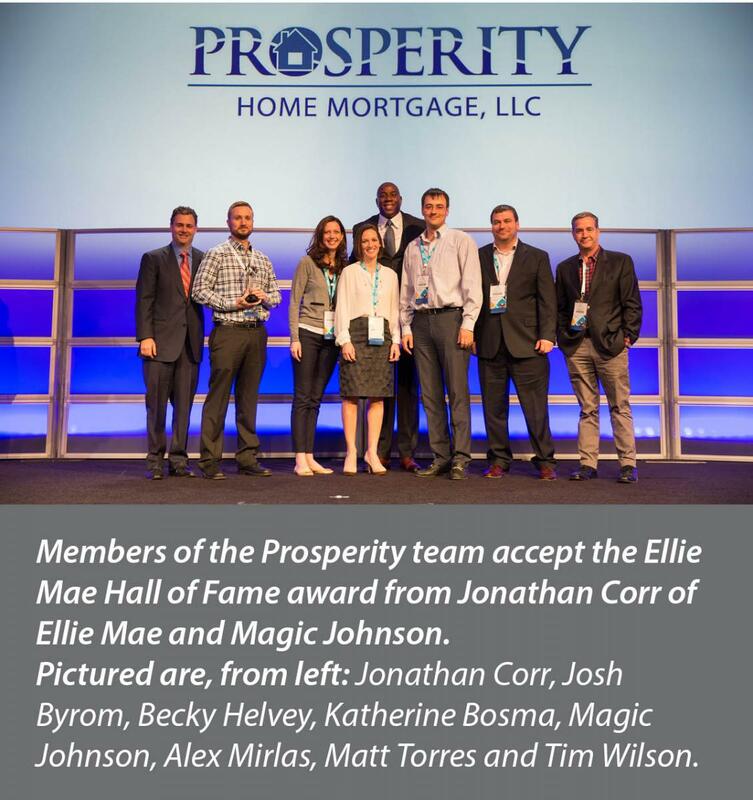 We are proud to announce that Prosperity Home Mortgage, LLC (Prosperity), has been inducted into the Ellie Mae Hall of Fame, an honor given each year to mortgage lenders and partners that have distinguished themselves through their industry leadership and innovative use of Ellie Mae technologies! Prosperity was selected as a winner in the Outstanding Efficiency and ROI category. This year’s Hall of Fame winners were announced in six different categories at the 2016 Ellie Mae Experience conference, and several members of the Prosperity team were in attendance to accept the award. Ellie Mae is a leading provider of innovative on-demand software solutions and services for the residential mortgage industry. Mortgage lenders of all sizes use Ellie Mae’s Encompass® all-in-one mortgage management solution to improve compliance, loan quality and efficiency across the entire mortgage lifecycle. Click here to learn more about Prosperity! Click here for more information on the Ellie Mae Hall of Fame! About Ellie Mae: Ellie Mae (NYSE:ELLI) is a leading provider of innovative on-demand software solutions and services for the residential mortgage industry. Mortgage lenders of all sizes use Ellie Mae’s Encompass® all-in-one mortgage management solution, Mavent Compliance Service, and AllRegs research, reference and education resources to improve compliance, loan quality and efficiency across the entire mortgage lifecycle. 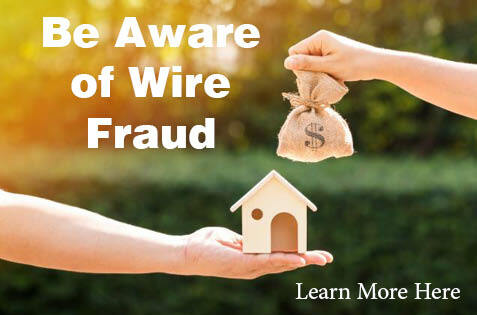 Visit EllieMae.com or call (877) 355-4362 to learn more. If you’re involved in a real estate transaction, whether you're the buyer or the seller, understanding the importance of an appraisal—and what it says about the home—is critical. In its simplest terms, the appraisal is a professional assessment of a home’s value, performed by a licensed appraiser, who considers things such as the property’s features, current market conditions, and supporting data on sales of similar properties. From there, an appraiser will use a formula to calculate the true value of the home. 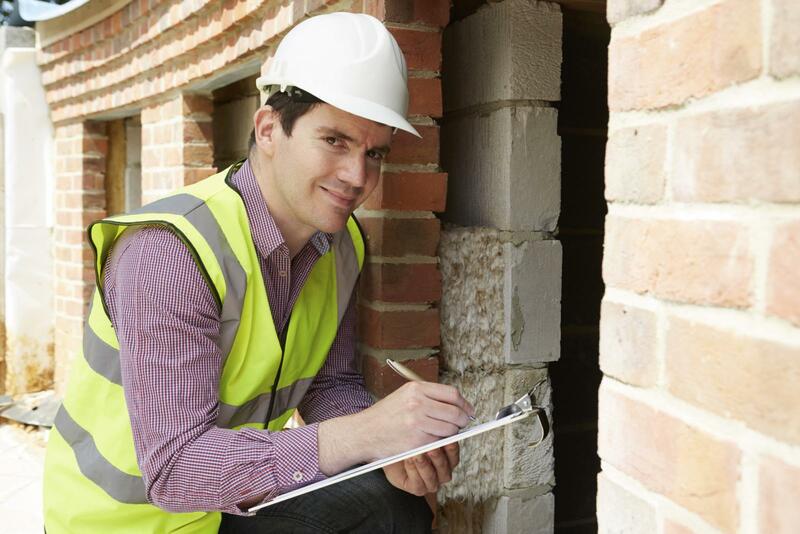 Appraisals are conducted by independent contractors who have no affiliation with the buyer or seller. Appraisers work for a fee, rather than a commission, so there’s no bias on his or her part when determining the value of a property. Not only does the appraisal allow sellers to establish a fair market value of the property involved in the transaction, the appraisal process also goes a long way toward helping a lender determine how much they can safely lend to buyers. While all appraisals are different, ranging in length from a few pages to more than 100, they all include details about the house, a description of the neighborhood and side-by-side comparisons of similar properties. The appraisal will also contain an evaluation of the area’s real estate market, notations of major problems with the property that will affect its value and an estimate of the expected time it will take to sell the property. Many of today’s appraisals are placing a greater emphasis on green features, with appraisers estimating higher prices when energy-efficiency methods are installed, a trend that’s not likely to go away anytime soon. This is something that you or your REALTOR® should point out if you’re accompanying the appraiser on the viewing. In the end, keep in mind that you don’t necessarily need to agree with the outcome of an appraisal and base your buying or selling decision strictly on the results that come about through the process, but the appraisal is an important barometer to keep in mind as you work with your agent to determine the best price point at which to list your home. To learn more about the appraisal process, contact a local mortgage consultant today. If you’re planning on purchasing a home this year, here are a few tips to keep things moving smoothly throughout the process. 1. Communicate with Your Agent. Work with a real estate agent that you are comfortable with and be sure to express everything you want and need in your new home. By communicating your desires from the beginning, your agent won’t waste time showing you homes that don’t fit your criteria. If you know you want a gourmet kitchen or walk-in closet in the master bedroom, make that clear. Or if you absolutely have to be near public transportation, tell your agent to avoid turning the process into a guessing game. When it comes to finding the perfect home, clear communication is key. And if you run into any problems along the way, be sure to speak with your agent to iron out any issues. 2. Be Reasonable with Expectations. If you’re searching for a three-bedroom home located in a certain neighborhood that has a pool, finished basement and sunroom and your agent shows you a property and your biggest qualm is the color, don’t simply write the home off. When searching for the home of your dreams, you may have to give something up or make some changes once you move in. Finding a home that’s 100 percent what you want can be a daunting undertaking. 3. Don’t be Discouraged. Don’t expect to find your dream home overnight. Buyers often get frustrated because nothing pops up in the first week or two, but remember, you’re not buying a new toaster. You want to find the home that you and your family can live in and love for years and years to come. 4. Play the Money Game. If you offer $375,000 on a home that’s listed at $400,000 and the seller refuses to budge, be prepared to negotiate. When buying a home, you need to have some wiggle room. Before making an offer, discuss your strategy with your agent as he or she will be able to tell you whether your offer is fair or unreasonable. It’s also important to check out comps in the neighborhood so that you can make a reasonable offer from the get-go. 5. Get Your Mortgage Pre-Approved. This could be the smartest thing you do all year. By having a mortgage approved before you even begin looking at houses, you’ll be ready to make an offer as soon as you find the home of your dreams. Getting pre-approved will also give you the upper hand over other buyers who may be interested in the same house. For more tips for a smooth home-buying process, contact us today.